This new wood carving of a pigeon fancier outside the Skinningrove Homing Society hut was unveiled in late August 2011, its the work of Steve Iredale who is responsible for many similar carvings in the area. The jetty was originally constructed between 1882-1887 by the Skinningrove Iron Company. Attempts were made to destroy it in WW2 to prevent it being used as a German landing point, but failed due to its unusual contruction from cement made of molten slag from the blast furnaces. The jetty is currently in a bad state of disrepair although its still used by local fisherman who occasionally fall in the holes and hurt themselves. The plaque on the wall is also by Nicholas Dimbleby the same as the statue on the green. This obelisk marks the location Captain Cooks family cottage. 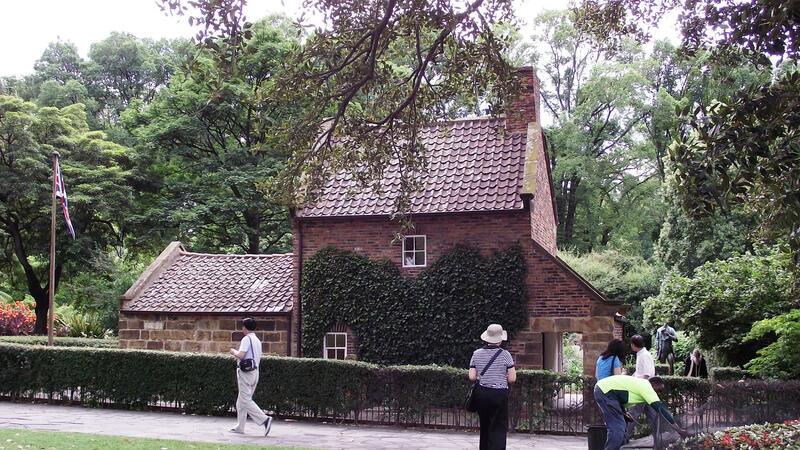 The cottage itself was shipped to Australia for the Centenary of Melbourne in 1934 where is still stands in Fitzroy Park. The cottage was built by Cooks parents in 1755 so its unlikely Cook himself actually lived there as he moved away to Staithes in 1745. The obelisk is constructed with stone from near Point Hicks which was the first part of Australia spotted by Lieutenant Hicks from the Endeavour. It is a replica of an obelisk that stands there. The unveiling of the obelisk was actually captured and is available on the Pathe Website. UPDATE : A friend of mine has recently visited the cottage in Australia, so many thanks to Eric for the photo. It has some similarities to this photograph, however this is not the event itself as no photographs of that are known to exist. This pillbox just 175m SW of the previous posting was also part of the defended locality of Kirkleatham Hall. Unlike the other this pillbox is faced with bricks, however it is also in excellent condition as it sits on private land in the middle of a working farm. A central door into a small chamber leads to two larger firing positions. Inside the chamber with the larger embrasures there are two gun platforms and all the metal shutters are still in place, the wedge shaped hole in the wall being to accommodate the legs of a tripod mounted machine gun. The map of Defence of Britain data shows the huge amount of effort that was put into defending Kirkleatham Hall. The outer chamber contains four small loop-holes while the inner chamber has a gun platform with three larger embrasures. The pillbox is in very good condition as it sits on private land and was sufficiently quiet for a family of swallows to be nesting inside. My thanks go to Barry from Acro Engines and Airframes for arranging my visit to the site.